If you haven't heard about Lightning Bolt yet, maybe it's time you should, there are only two members of the band; Brian Chippendale on drums and Brian Gibson on bass, yet they manage somehow to create the thickest noise this side of a jet engine. Holding the microphone firmly in his mouth, Chippendale's shrieks are accompanied by lightning fast cartoon-ish drumming (think Fantomas) and Gibson's insanely processed basslines. The result is something which sounds a little like metal, a little like noise, a little like punk and a little like nothing you've ever heard before. 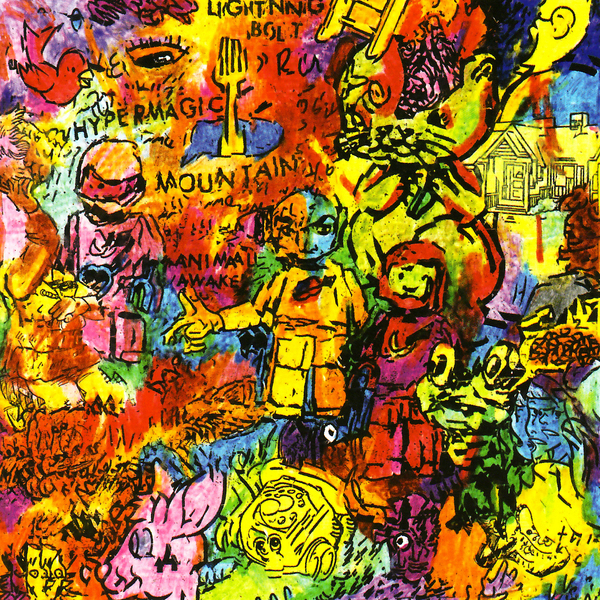 They are true originals, and their sound has been winning over fans since the first self titled album, 'Hypermagic Mountain' is their fourth and has a more polished and more song based feeling than the rest of their catalogue. Quoted as saying many of their previous efforts were based more on their guerrilla live shows than actual songwriting, here we are presented with 3 minute pop songs, sort of. Coming across like a crack-addled Van Halen jamming with Kenny Loggins as played by Wolf Eyes we have bass solos, vocal choruses (almost) and screaming rawk climaxes; don't believe me? Then skip straight over to 'Bizarro Zarro Land', 'Bizarro Bike' or 'Captain Caveman' for a booty shaking hair metal onslaught you never thought you'd be into. An essential experience, Lightning Bolt are your new favourite band.